I`m not really expecting a photo of a ghoul to be posted in this weeks thread but you never know! 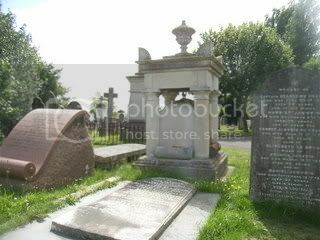 I have lived in this island for almost thirty-five years and have not yet seen the grave of Lillie Langtry so will make the effort to go and find it. 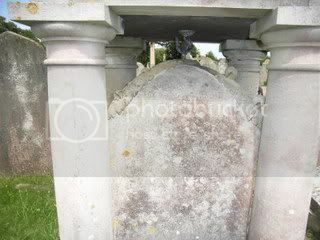 I have so many graves and gravestones photos that it will take me some time to decide which one to use... I always visit cemeteries on my travels. I'll start the ball rolling, unless someone beats me to it, with this image of the tombstone of the famous Scottish leader Rob Roy McGregor. We visited his grave at Balquhidder in Scotland a couple of weeks ago. He fought against the English in the Jacobite wars, and his epitaph declares his national pride! What a great topic! My daughter decided to have a combination Hallowe'en/birthday party last year as her birthday falls in the week following Halloween. I've got hundreds of pictures of teenage ghouls and ghosts but was hesitant to put pictures of the kids on the 'net without their or their parents' permission. 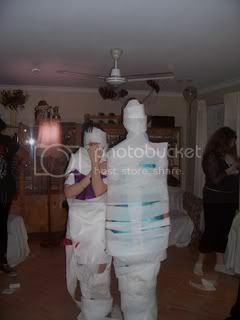 However, in the end, I decided on the victims of the mummy-wrapping competition since you can't see their faces. Haven't any gravestones, ghouls or gargoyles yet, but did want to say what a cool slide show of last week's reptiles and spiders. Thanks roos! I've opted to go with the rather ornate grave of Sir Wilfrid Laurier, Prime Minister of Canada from 1896-1911, in Notre Dame Cemetery in Ottawa. The plain black headstones to be seen on the left of the photo are those of nuns. Went for a trip to the town cemetary today and picked out the most ornate old grave I could find. It's the first time I've ever had a really good look around this little cemetary and it's in quite sad repair, really. Because it was such a transient population there's heaps of unmarked graves and far too many little ones. of their good priest and zealous pastor. Having decided that the inside of a 6000 year old tomb is slightly off topic here I have decided to post the grave which amused me yesterday, the one with the enormous weight on the top to keep the person well and truly buried. 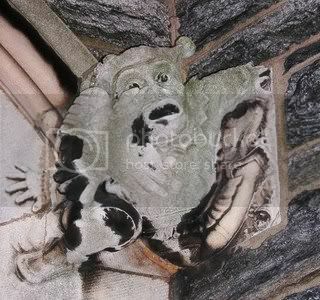 My daughter told me this was a Gargoyle when she bought it for our garden, but I'm not sure, since they are usually attached to buildings, but it's the best I can do. I'll let you decide. 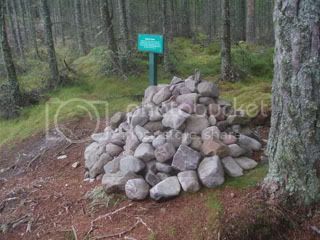 This is Ranald's Grave, which can be found on blue route of the winding walks near Fochabers. "Ranald was chief or king of a band who camped here, robbing wayfarers on the old Aberdeen - Inverness road. Rightly or wrongly Ranald was tried and executed on this spot. 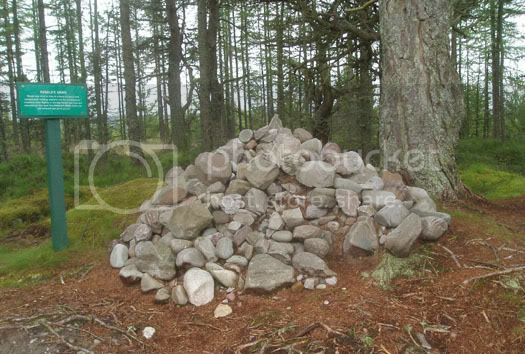 Thus Ranald's grave marks the old campsite and burial ground." 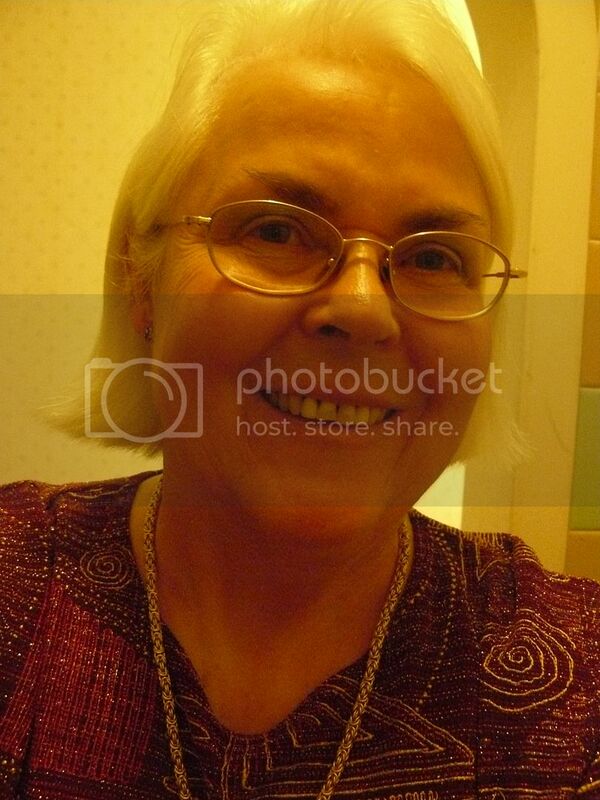 Here's another one of it. 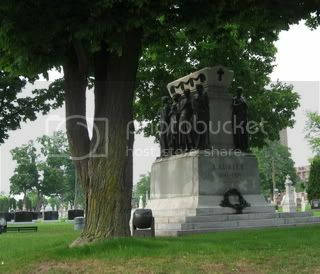 Here,families may choose to have their ancestors cremated or buried cemeteries . Families visit their ancestor's resting place, especially during the Chingming Festival. They would bring joss sticks, incense paper and food offerings to the ancestors. According to Chinese custom and tradition, people worshipping ancestors at Chinese cemeteries must first lay out their offerings and prayer items before burning the joss stick. 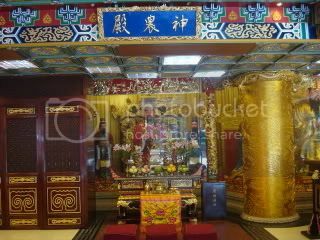 The worshippers may then recite prayers before proceeding to place their joss sticks on designated areas. The worshippers then burn the incense paper and collect the food after worship. 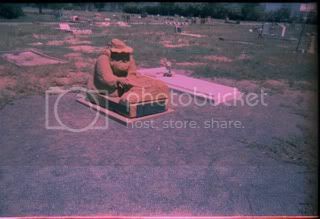 However, there being not an awful lot of room here in cemeteries, many people go to worship ancestors in a columbarium. Near me there is a new one and it is very posh indeed, if a little garish.This is the part where, if your Mummy,Daddy, Grandma's spirit etc is deposited here , you can pray to them. I think you probably have to pay quite a bit to have them here in the first place.If these places are built in residential areas, you find the neighbours complain as they do not want spirits around at night time. So this one is in the midst of a lot of factories! 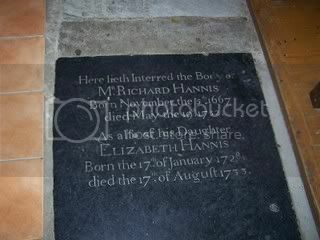 This is one of the graves that is inside St. John's Parish Church in Barbados. The church was built in the mid-17th century, but was heavily damaged by a hurricane in 1831 and rebuilt in 1836. There is also a large graveyard outside. Services are still held weekly. Ah, just in time. 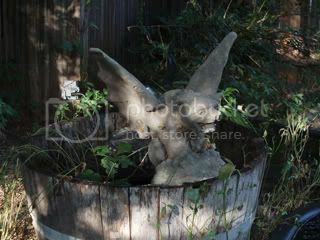 This is a picture of a gargoyle in my friend's back yard. Finally found one locally! This photo is of Lasseters Grave in Alice Springs,Northern Territory,Australia. Lasseter was a miner and explorer that claimed to have found an incredibly rich gold reef. Many people in Australia have searched in vain for his now legendary reef and probably many will in the future search for it. He died whilst trying to re-find his gold reef. 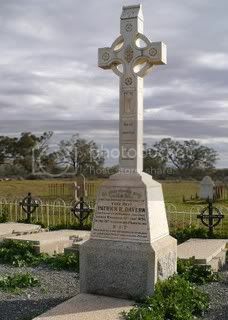 There is another famous Australians grave in the same cemetery but I couldn`t find a snap of it in my collection. Albert Namatjira`s gravestone has one of his paintings on it and makes for a beautiful gravestone. Only 24 hours to go till this thread is locked! This fellow lives in Glenside, but we hadn't met until this evening... looks like I scared him pretty good! 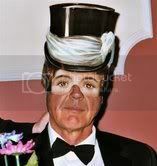 Once again all terrific photos. 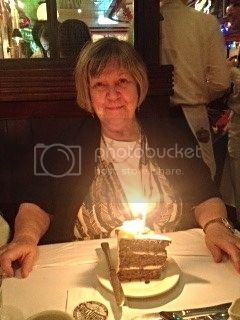 I`ve created another slideshow and dumped the pics in there at random,not every photo can be there but how I wish they could! I loved that too, a really great topic. Thanks Roos! - Another fitting conclusion to the theme. Time to move on to the 'Views From A Window' Theme. Looking forward to the next show.